Welcome to the More Than English Podcast. Each week, we will talk about culture, personalities, stories, and learning in general while learning useful English phrases. Come join us! Ep. 52 - Are You Planning To Move Abroad? Moving to another country or a new place in your country can be a little scary. New people, new shops, new ways of doing things, and even a new language! Jesse wants to share some tips from his experiences of moving to two different countries. Learn some advice of what you can do to make your move to a new country as smooth and beneficial as possible. You will first hear some reminders of all of the logistics to take care of. Visa, bank account, etc. After that, you will get some practical day-to-day advice to help you fit in and appreciate the new culture that you are going to be a part of. Some things to remember in your move: become familiar with transportation, learn some basic expressions from the language, observe people and how they interact with each other, and meet and talk with as many people as you can. Don't forget to appreciate the new place you're in. Follow these steps, and your move to a new culture or new area can be a great opportunity for you to re-invent yourself or improve yourself. Visit sweedacademy.com for more notes and material. What are challenges? Jesse says that challenges are difficult things that when you overcome them, you will be a bigger and better person. Challenges can be scary because many people think that challenges are just difficult things. If there's no change, this is true. The thing that makes challenges so great is that they lead to change and growth. This is why challenging yourself is so important. We can challenge ourselves in learning new things, improving personal weaknesses, as a family, in our jobs or careers, anywhere we want to see growth. In this episode of the More Than English Podcast, Jesse gives some suggestions and steps you can take to start challenging yourself today even if you're not used to doing difficult things. Start small. To begin challenging yourself: 1. Find something you want to improve at or an area you want to strengthen. 2. Have clear objectives in what you want to see as the result. 3. Recognize and acknowledge when you've met and overcome a challenge. Even if it's small, and even if it's unexpected. Visit sweedacademy.com for more material. Did you realize that learning a new language is an opportunity? Maybe you did. But did you realize that it is an opportunity to find a new you. It's true! When you learn a new language, you're tapping into a new part of your brain and learning to communicate and think in a whole new way. By learning a new language, you will be able to see the world in a whole new way... well, you can if you allow yourself to do this. Jesse wants to share his experiences and tell you why and how you can and should become a new person by learning a new language. You are opening a door to a whole new world full of new ways to communicate, new ways to think, and a whole new perspective. In this episode, Jesse shares three tips to maximize this experience: 1. Learn the new language for COMMUNICATION 2. OBSERVE who you are in the other language 3. Shape that person and learn from that person Realize that in language as in life, the journey is the destination. Ep. 46 - What is a teacher? Are you a teacher? Yes, you are. Whether it is your job or not. We all have people who look to us to learn something. So do you. We've all had teachers that have impacted our lives greatly in one way or another, and we've all had teachers that we've forgotten. Probably more of the second one. What is a teacher? To quote Bruce Lee, "A teacher is never a giver of truth. He is a guide, a pointer to the truth that each student must find for himself." This is the philosophy I teach by. This is the philosophy I try to run my classes with. What does this mean and how can I apply it to my life? This is what Jesse talks about in this episode of the More Than English Podcast. He shares some of his teaching philosophy and how that helps him in the classroom and in preparation. Jesse also breaks down some useful English expressions during his talk. Visit us at sweedacademy.com for more material. In 1995, a middle-aged man named McArthur Wheeler decided to rob a bank. He wasn't wearing a mask as he smiled at the security cameras because he thought they would not be able to see him since he had covered his face in lemon juice. Yes, normal lemon juice. McArthur had apparently read somewhere that lemon juice can act as an invisible ink. He then came to the logical conclusion that he would appear invisible to the security cameras as well. This lead, eventually a psychological study called the Dunning-Kruger study. They concluded that the less you know about something, the higher your confidence is. After we actually learn a little bit, our confidence drops because we begin to see how little we actually know. I see this all the time as a teacher. Many of my students have studied English for years, and they can speak well. However their confidence is low. They can speak and understand much more than they think they can. Does this sound like you? The trick is to find that sweet spot. Jesse will share a few ways to overcome this confidence barrier, as well as teach you a few useful English expressions to help your English ability grow. Visit sweedacademy.com for more resources. Are you struggling with burnout? Burnout happens when you feel exhausted because you put too much effort toward something that gains you little reward. You experience 'burnout' when this happens for a long period of time. We all feel burnout from time to time. The question is, how can we change this and energize ourselves again? Many times, this comes down to balancing your EFFORT:REWARD ratio. In this episode of the More Than English Podcast, Jesse wants to share his experiences of feeling burnout, and help you with some tips and ideas to balance your effort:reward ratio. As always, he will teach some common expressions during his lecture and highlight the use of QUESTION TAGS. For more resources, visit sweedacademy.com. Ep. 42 - Use Procrastination For You? In today's episode, Jesse is giving you 5 specific methods to improve your English fluency. These tips and tricks are common problems and barriers that many learners of languages face. You may be doing some of these tricks, and you may not be doing others. If you incorporate at least one of these tricks to your English learning, you will notice improvement and be more confident in your English progress. As with each episode, Jesse will dissect and explore some of the natural expressions and vocabulary that he uses as he's speaking. These will help you grow even deeper in your English fluency. As always, find episode notes and more material at sweedacademy.com. Happy New Year! Are you looking for a new job this year? Jesse wants to share one of his favorite articles to do with students who he helps prepare their CV for a new job. Did you know that the average time an employer takes to look at the resume of a potential candidate is 6.25 SECONDS! That's not much time to make a powerful impact! The article we're working from is from Forbes.com and it is called 'The Best and Worst Words to Use on Your Resume'. https://www.forbes.com/sites/susanadams/2014/03/17/the-best-and-worst-words-to-use-on-your-resume/#78d6066348cf In this episode, we will take a look through the list, explain some of the words and examine why they are on the list of either BEST or WORST words. Jesse will also teach some new expressions to help with your English fluency. For more information and resources, visit sweedacademy.com Find your English CV or resumé, and get ready to make some changes and make it more powerful for your future employers because it's not just English, it's more than English, let's go! Ep. 34 - A Reason vs. An Excuse? Ep. 33 - Do You Have 10 Minutes A Day? Ep. 32 - Use Muscle Memory to Improve Fluency? Learning language isn't much different than learning a sport, an instrument, or how to do anything. Repetition repetition repetition. You will perform how you practice. In this episode, Jesse talks about studying English in a different way. Focus on the muscle memory with your brain and your mouth to get used to doing it the right way. Jesse gives some tips and examples for you to practice this on your own or with your teacher. If you would like to study with Jesse, visit sweedacademy.com and sign up for a lesson. Also, visit sweedacademy.com/podcast for episode notes. I have to fix what I said last week. I tried doing what I asked you to do, and I realized a way to make it BETTER! Follow me and create ONE goal for yourself and plans of action. Last week, I had assigned you to write three goals for yourself... however, after doing that assignment MYSELF, I realized that creating three goals might be too much to as of ourselves. Instead, focus on ONE goal and plans of action to accomplish that goal. Your goal should be: - specific - you can check off yes/no if you did it - concrete - include an amount or time frame - realistic Jesse talks about this and more in this episode of the More Than English Podcast. Visit sweedacademy.com/podcast for show notes and more. Let's talk about the most common thing that holds learners back from learning something new or improving something... self-belief. In other words, CONFIDENCE. If you believe you can or you believe you can't, you're right. This is what I want to talk with you about today. I will share a story of a student and help you in your confidence because believe it or not, you know more than you think you know. You're better than you think you are. You can do more than you think you can. Visit sweedacademy.com for show notes. It's always important to get off to a good start and make a good first impression. However, starting a conversation is often very difficult and makes us nervous. In this episode, I want to share some strategy, tips, and expressions to use when you want to start a conversation with somebody. After the episode, we will have an English lesson and look at the expressions, vocabulary, pronunciation, and some grammar from this episode. Learn these, practice these, and use these next time you want to start a new conversation. Go to sweedacademy.com/podcast for episode notes and a listening quiz. Do you feel like you're not improving in your English? There are many complicated parts of English that students find very difficult. Maybe you're studying grammar, vocabulary, phrasal verbs, expressions, verb tenses, and other details in English. In this episode, Jesse teaches you a trick to try when you get stuck with your English and you feel like you're not improving. The secret is... Less is More. Focus on only one grammar point, vocabulary, or expression that you're having trouble with and become obsessed with that for one week. Jesse will go into further detail with this in this episode. Visit sweedacademy.com/podcast for episode notes and a listening quiz. IELTS Speaking Part 2 is "The Long Turn", or as many students say it, "The Hell Turn." I asked Dr. Peter Crosthwaite to share tips and advice to be successful on this part of the speaking exam. He will give you study tips to prepare for the exam, advice and things to say, and some common mistakes to be careful for and not do or say on your speaking exam. If you are preparing for a speaking exam, this advice is a must listen. At Sweed Academy, you will see a listening quiz to go with the conversation. At the end of our conversation, we have natural English conversation and banter that will really help your REAL English listening. As always, after the episode, we have a Visit https://www.sweedacademy.com/podcast for notes and a listening quiz. In Part 2 of my interview with Dr. Peter Croswaithe, we talk about his specialty... IELTS Writing and Speaking. He gives some POWERFUL tips to be successful in your IELTS Writing and Speaking exams. Note: We don't talk about specific expressions or 'templates' to use. We talk about overall strategy and tips. We talk about: - Basic Strategy - Pronunciation and Accents - Vocabulary and Expressions And then you'll have a vocabulary lesson. Go to https://www.sweedacademy.com/podcast for the vocabulary and a listening quiz. "I'm not a language person." This is a lie that I used to tell myself because I was either too lazy or didn't know how to learn, so I didn't learn Spanish when I was in high school. We sometimes say, "I'm not a musical person." or "I'm not a business person." and this mindset holds us back from learning and improving in many areas. In this episode, Jesse talks about this mindset and gives advice on how to overcome this mindset and improve anything you want. Visit sweedacademy.com/podcast for show notes and a quiz to test your listening. Ep. 16 Who is responsible for the learning? Some people have the opportunity to live abroad at a young age... and some people are faced with the trial of living abroad at a young age. 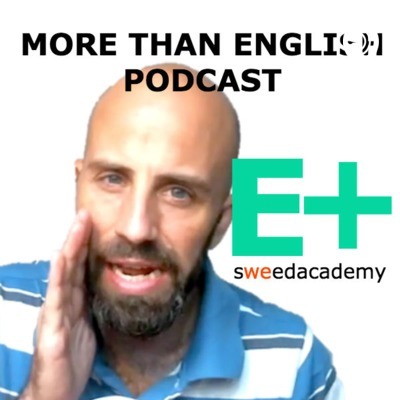 In this episode of the More Than English Podcast, we will hear a bit of both. Listen with me as I interview a native Japanese speaker and listen to her story of moving to the US for about a year and a half​ and then moving back to rural Japan. Listen to what it was like for her to adjust and she also gives some tips and advice for people learning English. ​ Subscribe to us on your favorite podcasting platform to get new episodes each week. Don't forget to visit us and subscribe on YouTube.com/SweedAcademy. Visit sweedacademy.com/podcast for additional notes and material. Thais Souza is a UX/UI designer who is living in Munich, Germany. We have a conversation about why she had decided to move from Brazil, what it's like to live in Germany, and why she decided to learn English. If you want to look at more of Thais' work, you can contact her at http://www.thaisouza.com/ . Go to sweedacademy.com/podcast for show notes and other episodes. Episode 10 of the More Than English Podcast where I speak with Luke Kim of Luke Look English. Luke talks about the first part of his journey to English fluency. He started later than other students, others teased him for not knowing as much, and he was faced with a decision.- Do I give up because I'm being made fun of, or do I attack this and become better?- He uses many useful expressions very naturally for you to learn from. Stay around until the end of the video to get explanation of the expressions and vocabulary. Learn some English expressions for health and doctors. What do you say in English if you hurt your back? What if you have to go to a doctor? How can you describe it? I recently threw out my back. What does that mean? Basically, it means my back seized up and I was in a lot of pain and I couldn't move. I will talk about how I injured my back, what I'm doing for recovery, how I feel, and a lot more! Learn useful vocabulary and expressions to improve your NATURAL English speaking! Visit sweedacademy.com for a list of the expressions you will hear in today's episode. Practice and use these expressions the next time you have an English conversation. Not all of the expressions I say are about an injured back. These are expressions that can be used in many different types of situations. If you have any examples that you'd like to try using these expressions or others, send me your examples on Facebook or Twitter.